No-longer-bankrupt solar sales firm Sungevity has laid off two-thirds of its remaining technical staff, breaking the news at a company meeting today, according to sources. The company will provide no severance to the laid-off employees. PV Magazine reported yesterday that a bankruptcy court approved the sale of Sungevity's assets to private equity firm Northern Pacific Group for $50 million, allowing "the company to invest $20 million in the company immediately." An unsubstantiated rumor suggests that the firm has begun requesting pre-petition privileges from some of its suppliers, offering 40 cents on the dollar for its existing and outstanding liabilities. The sale follows several rounds of staff reductions that mistreated employees with ambush layoffs, no severance and bounced paychecks. A source tells GTM that executives who presided over the bounced-check payroll have blamed the bank, "but it's logical for accounts to be frozen early in a bankruptcy, especially when the bank is one of the creditors!" Other sources tell GTM that expert bankruptcy consultants were brought in long before checks bounced and accounts were frozen. More than 350 people lost their jobs. 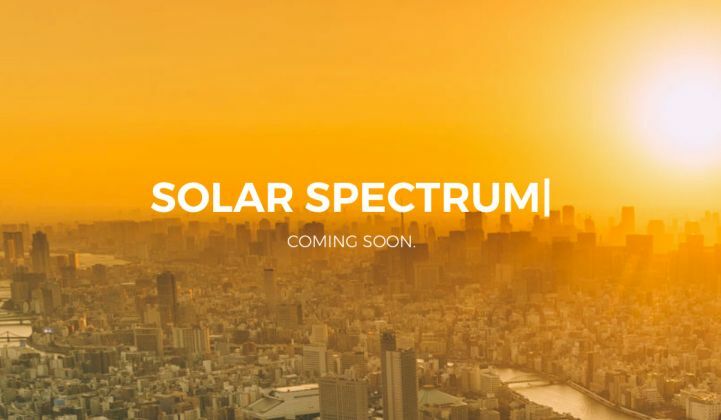 GTM has learned that the firm will be renamed Solar Spectrum and will no longer be offering third-party financing. 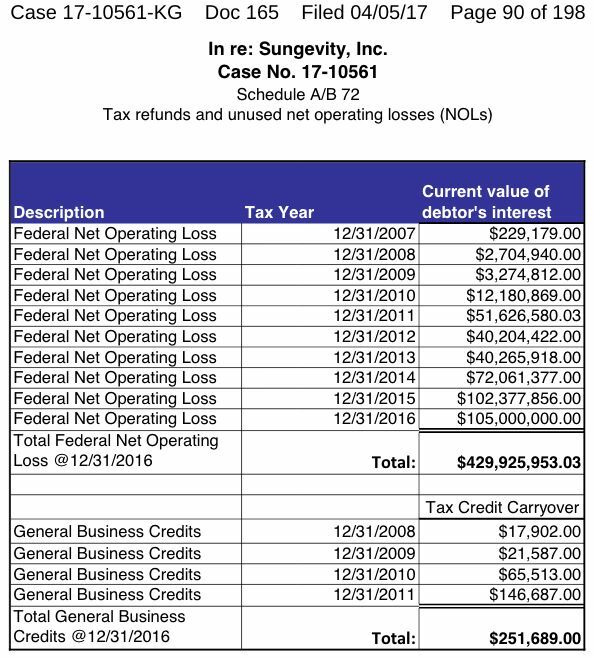 Data on Sungevity's annual losses from 2007 to 2016 was recently added to the bankruptcy docket (PDF). It looks like the firm has lost almost half a billion dollars since its inception. The San Francisco Chronicle recently reported on claims that Sungevity held on to money meant for solar panel installers, who in turn had to place liens on customers' homes. A Sungevity leasing customer, who expressed satisfaction with the company's service, wrote, "My concern is that the assets I have leased from the company will be sold and my rights negatively impacted from such a transfer. I entered into my lease agreement in good faith that both parties would honor the terms of said agreement. I paid upfront all my lease costs for the entire term. I would expect any buyer to honor that payment and all other terms of my agreement. I contacted Sungevity immediately upon receiving the court notice of the proposed sale." The customer wrote that Sungevity "responded quickly, stating that the sale should have no effect on my lease," according to a letter (PDF) in a court docket. Can a consumer-facing solar company recover after dumping its employees and going bankrupt? A source tells GTM, "Bankruptcy provides a clean slate after a company bounces paychecks, steals earned vacation pay, and fails to warn employees about impending layoffs, but when the ill treatment extends to customers, the marketplace might prove less forgiving." Here's our previous reporting on the Sungevity saga. One would hope that Sungevity, a solar sales firm that stressed its human and social mission, would not completely bilk its staff as it goes through a difficult bankruptcy and potential asset sale. With the caveat that these are anonymous comments on Glassdoor and sentiment is raw, let's look at recent postings from ex-Sungevity employees. "For a company that prides itself on transparency -- they truly left all their employees in the dark in terms of the bleak corporate outlook. They knew they were in a grave situation, yet kept their employees on long enough to be so in the hole that they couldn't pay out rightfully earned vacation time." "The way [the layoffs were] handled and the obvious fact that upper management knew that this was inevitable once the merger fell through, yet still tried to spin it at every town hall that things were still 'sunshine & cash flow positive rainbows' is a disgrace and inexcusable. It goes against the company's mission that was drilled down our throats since day 1." "We were told our financial disaster was because of Trump's election. Gimme a break. We blew through hundreds of millions of dollars on overhyped technology, crappy sales strategy, and expensive debt. Trump is just an excuse. This is a profound failure of senior management and all of us in the trenches had to pay the price." "Birchy, you truly are one of the nicest and congenial guys out there but you had no business being a CEO and that should have been left up to someone with a better understanding as to how to allocate resources properly rather than blowing through almost a billion dollars in VC funding while trying to figure out how the company chose to define itself. You should have left the big decisions to someone who could have made more objective decisions as a company/business rather than someone who is a solar evangelist who thought that someday, if he just wished super hard enough in his mind, we would somehow magically make money." "Without any notice, they let most of their employees go, including some really talented people who have been loyal to the company for years." "'Sfun' used to be the company's acronym for Solar for Universal Need but really represented all the fun things the company would do. Wish we had that money back now so that we could pay the light bill." "The worst came when out of nowhere the company decided to lay off most of the company's employees and not pay us what they owed us. They held up jobs intentionally knowing that they were going to fire the entire sales team so that they would not pay commissions and even the commissions that were owed were not paid out at the time of termination. Since then HR and payroll have confirmed to us that they have no intention of paying any of the money they owe us." Sungevity filed for Chapter 11 protection in March and entered into a court-ordered "asset purchase agreement" led by Northern Pacific Group that promises up to $20 million to fund day-to-day operations. GTM's Julian Spector broke the news of a 66 percent layoff of Sungevity's workforce in March. The company had already cut dozens of workers in January after an expected merger fell through at the close of 2016, taking with it the promise of a $200 million cash infusion. (We covered that failed merger here.) At the time, the company had declined to pay severance or accrued vacation days -- instead, it merely handed out checks for the last pay period and sent people on their way. The Mercury News reported that those March 9 paychecks bounced for many of the 330 employees who were just laid off. 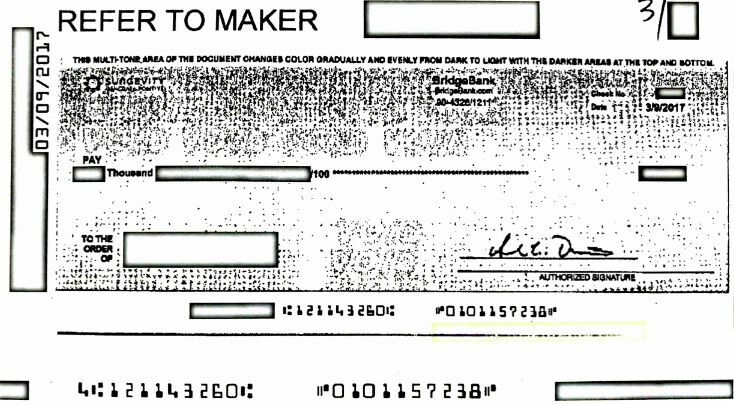 An ex-employee provided GTM a redacted copy of their bounced check. Here's a bounced check from VP and GM of programs Herve Pluche's claim. Pluche has filed a claim for $97,928. A former employee said he had been told by the company that the bank issues were being remedied and that the final paychecks would be transmitted through a direct deposit. But, according to emails obtained by GTM, Jonna Hensley, Sungevity's "VP, people" wrote on March 21, "Sungevity has filed a supplemental motion with the bankruptcy court," adding, "The motion will be heard by the bankruptcy court on April 7th, and Sungevity will look to reimburse employees for those checks." That's how the company has treated its staff. As for their creditors -- aside from the big dogs such as Crius (owed $456,358) and Google (filing for $517,216) -- there are the folks that can least afford being owed money, such as employees deprived of accrued vacation pay, wronged customers, underpaid yoga teachers ($50 per class, namaste) and software coders. The company's model sounded good on paper: use software to generate quotes without the need for site visits, but outsource the hardware, installation and financing, keeping those items off the balance sheet. The company could focus on customer relations without investing in all the capital-intensive parts of the solar business. Had Sungevity viewed itself as a solar software startup and licensed its customer acquisition platform for use by hands-on installers, it may have avoided the capital drain that comes from managing installations. Instead, the leadership split the difference, becoming a software company that's not quite an installer, and an installer that's not quite a software company. Even the lead generation, which appeared to be a key value-add of the model, was going out the door as Sungevity focused on turning itself into a "platform." Sungevity's market share peaked at 2.5 percent in 2014 and was at 1.6 percent in Q3 2016, and total capacity installed peaked in Q1 2016, according to GTM Research data. The firm had announced a total of $850 million in VC and project financing, with an estimated $200 million of that coming as equity funding. So, does this article have a lede? Sungevity knew bankruptcy was looming and had to make a choice in a race against time: be straight with its employees and honor its human capital, or play a game of brinksmanship that leaves the bones of the company picked clean by a private equity firm and its laid-off staff deprived of money they've earned. There's no good way to go bankrupt. It's a fiscal and emotional calamity for all concerned. "Throughout this strategic “pivot” process -- which included layoffs, several months of negotiations with potential licensees and/or acquirers of the company, and a continuously diminishing cash balance -- management maintained an open dialogue with the QBotix staff. Each member of our now pared-down team knew exactly how much runway the company had remaining, the status of our strategic talks, and the acknowledged long odds we faced as a going concern. To their credit, they remained focused, productive and on-task until our final day -- a remarkable expression of dedication to the mission and to each other. Sadly, and in spite of the achievements, we simply ran out of time and cash to finish the job." Perhaps there's still a chance for a graceful ending or an against-the-odds restart for Sungevity. 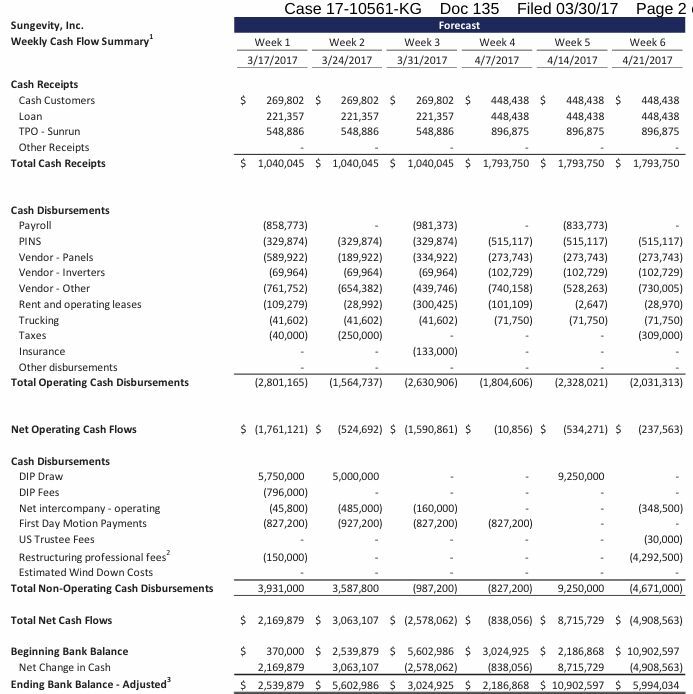 Here's a weekly cash flow summary that reflects the $20 million cash infusion from Northern Pacific Group. Julian Spector contributed to this article. Listen to The Energy Gang contemplate the meaning of the Sungevity bankruptcy. What does it say about the national installation and sales model?